When asked about the cause of growing interest in 3D printing, Reis explained, “Several reasons: One is a major reduction in 3D printer prices.” He continued, “Another is that governments worldwide realize 3D printing has the ability to bring manufacturing back home. The Obama administration will provide $60 million for additive 3D manufacturing activity. The European Union has a similar program to finance 3D research.” There’s also an emphasis on attracting students, he pointed out. IBD asked, “Do you foresee 3D printers being ubiquitous in the home?” Reis replied, “I’m not sure what the right answer is here… It’s going to take time, not because of the printing process but because of the materials you’ll need. It’s not like buying ink for your computer printer.” No, I doubt I’ll ever debate over a 3D printer like I do with paper printers on whether I should buy an ink cartridge or just spend the extra $5 for a new printer. 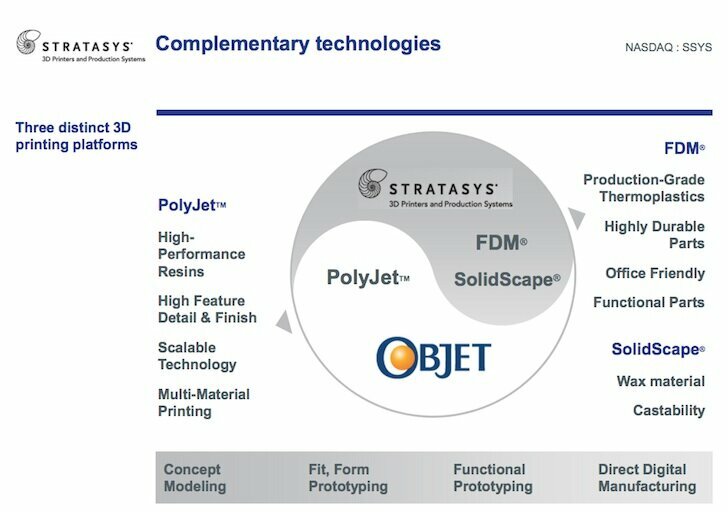 IBD concluded with questions about the global economy, Statasys’ plans for 2013, and if government regulation was impeding the 3D printing industry. Reis responded succinctly, “A lot of our customers use Objet and Stratasys equipment. I see both companies having the ability to cross-sell into the installed base and increase our number of printers in the market… The world clearly in the past year did not fully recover from the 2008-09 recession. But both Objet and Stratasys in most parts of the world were successful and grew at very strong double-digit rates, even in places where we did not expect.” And in regard to choking regulations, “I see it as the opposite. Governments are encouraging 3D printing and additive manufacturing. I see this as a positive. We’re in good shape.” Apparently sometimes the government gets something right. I’m really looking forward to seeing what this newly-merged company does. Stratasys was the larger of the two, but personally, I like the Objet model more. Objet has a strong focus on multi-material printing, and that’s just so practical for end-product printing, which some companies and industries have already shifted to. The giant Stratasys customer base will surely synergize with Objet’s more appealing presentation of its technology. Any way you look at it though, this is a big move in 3D printing.